Last spring in late March I wrote a post about my brother’s comment on the fact that a little cubbyhole in my car contained a bottle of Grif’s head cement in it, instead of gum, or lifesavers, or Altoids. Could have been loose change, paper clips, AAA batteries, aspirin; anything but head cement. I thought it perfectly normal, because I’m a fly tier. Well, I have another installment to make along the same topic. In other words, I’m confessing another habit that is normal only to fly tiers. My laundry from earlier this week. Yup. You’re eyes are not playing tricks on you, unless perhaps you have been recently exposed to a large container of weapons-grade blackberry-flavored head cement thinner. That’s a natural, not-dyed deer tail. Why is it on my clothesline? I was tying some streamers with white bucktail bellies, and I like to stack my bucktail bellies just a little bit. Even the tips, not to perfection, just clean ’em up a bit. This tail was contrary. It felt tacky. The hairs didn’t want to let go of each other and stack nice and orderly as they should. I finally had enough of it, remembering my issue last March tying Footer Specials with dark blue bucktail. I had one that was tacky to the point of being hopeless as far as any loosening of the hair to stack. At that time I’d had it with that tail, and threw it in my brother’s kitchen sink and gave it a good wash ‘n’ rinse in hot water. Stood it to dry on his porch railing. See the post – Washing Bucktail and Cleaning Hairstackers – or something to that effect. You can also click on the tags at the end of this post. I was watching a bunch of AK Best videos with my friend, TG, the last time were were at my cabin. AK says, “Never let a feather run your life.” Good advice. And I expanded that to include bucktails. In the sink, wash it, rinse it, no need to repeat, shake it and hang it to dry. It cleaned up good! Nice & soft, like your hair is when you’ve washed it and used creme rinse. Think about it…if you don’t stack but rather align and try to even the hair tips by hand, it takes you 30 – 45 seconds to do that. Clean bucktail stacks in 3 seconds. You’ll save yourself time and aggravation. This entry was posted in Fish Stories and Other Tales and tagged Hair Stackers, Washing Bucktails. I can see my spouse opening the washer with bucktails in it. Ha, ha. But I did wash some wet fly necks once and have never told her. You can also identify fly tiers when they look for road kill. Anyway, thanks for the stacking tip. You’re a naughty boy! You washed necks and never told you wife…! Well, sometimes what they don’t know won’t hurt them. 😉 However, in Steve’s case, another comment to this post…he apparently did not clean the dryer thoroughly after he used it to dry a deer hide. Thanks for your comment! Your observations are right on with the line of our “quirky” habits. My friends and I have often been the subject of stares and puzzled looks as we inspect the mayflies, caddis, and such on the windows of a mini-mart, or examining the contents of a spider web in the door frame. To the rest of the world, we are a weird lot. Thanks for your comment! Let me warn you…don’t put it in the dryer!! Last year I tanned an entire deer hide given to me by one of the hospital pharmacists…beautiful hide that tanned up nicely. 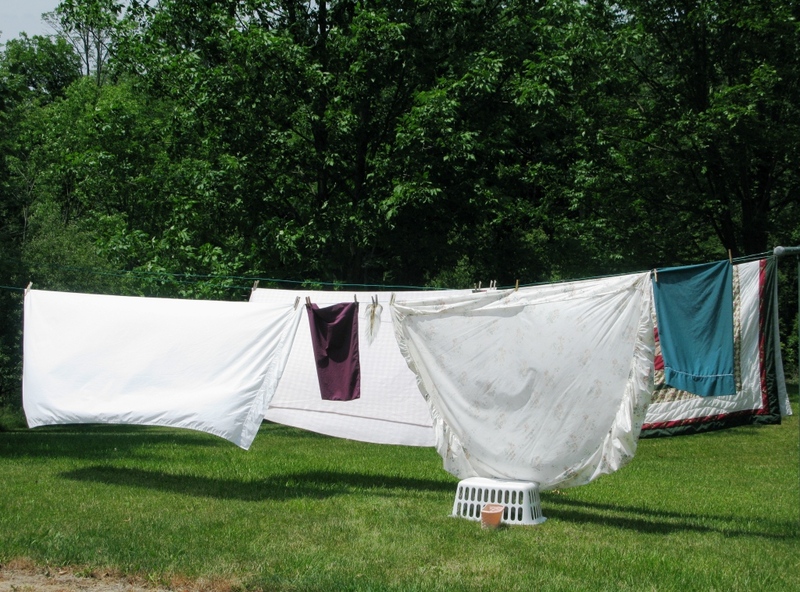 When my family was not home I dried it in the laundry dryer. It was winter and too cold to hang it up outside. The hide came out well but the dryer was a mess!! I thought I cleaned it out but then my daughter, who was home from college, decided to do her laundry. “DAD, THERE IS DEER HAIR ALL OVER MY CLEAN CLOTHES!!!!!!! !” I never heard the end of it from she and my wife. My fly tying materials are now banned from the laundry room! Your story is very funny! Reading it made me laugh! 🙂 I can just see that; if only the rest of my readers knew your profession. 😉 Before reading the advice in your comment I had already decided that I was not even going to wash my bucktails in the washer; there just may be enough loose hair and it could wreak havoc with my drain pipes or septic system. Even though, if I decide to wash ALL my bucktails – 14 – 16 full tails, plus a bunch of smaller pieces, it would be a small load and I’ll do it by hand. Now that I’m thinking about it I suppose I could get one of those mesh bags that women use to place their “unmentionables” and “delicates” in so they don’t get thrashed around and “abused” with the rest of the wash. 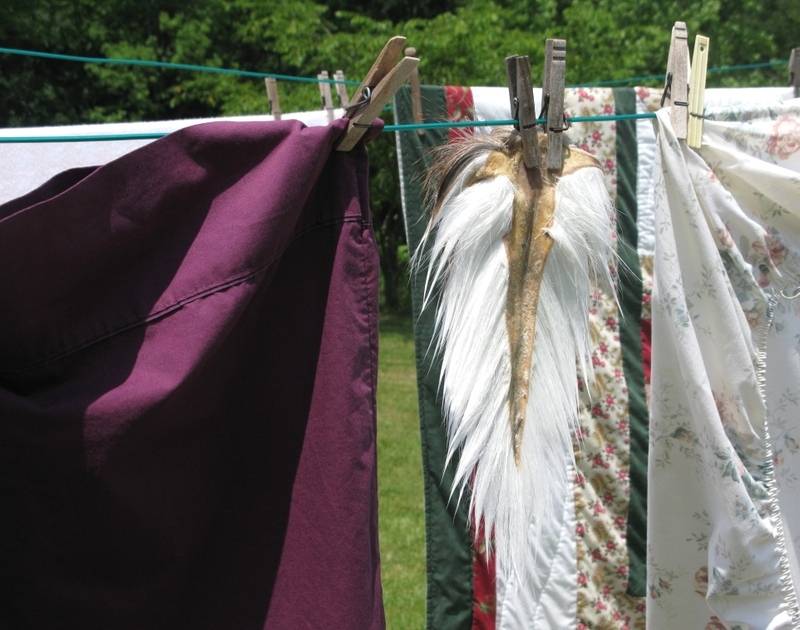 If, no, when, I do my “bucktail laundry” you can bet there will be a photo of it on here. Thanks for sharing your story! I have a bleached partridge skin that has feathers that seem to be “stuck” together and won’t separate nicely when wound. Could this be oil from the skin fats? Do you think a wash in warm water would solve this problem? You don’t use any sort of mild detergent? Probably so..thus far what I have washed re: tying materials, I’ve just used regular dish detergent. After all, that stuff is supposed to clean and remove grease, right? I’d say that should work on your partridge skin…hang it up to dry, outdoors on a breezy day would work, or maybe even use a blow dryer. They do get wet when it rains, so it should be fine. 😉 Thanks for your comment!